Nest Cam is one of our favorite home security cameras, so we were understandably excited to try out the new Nest Cam Outdoor. With a weatherized design and an updated app, it promises to bring the same solid security features and ease of use to the exterior of your home. “Outdoor camera” usually conjures images of the CCTV-type bullet cams so prevalent in strip malls and other places of business. Their conspicuous designs scream “surveillance” and probably aren’t the kind of thing you want marring the aesthetics of your home. And if the looks don’t deter you, then the prospect of having to drill through the walls of your home to route several cables to your router and an electrical outlet probably will. Nest Cam Outdoor does away with all that. First of all, it looks nothing like your typical outdoor camera. It sports a simple white cup design—similar to Netgear’s Arlo HD—so it won’t draw unwanted attention from intruders or persnickety homeowners associations. It also connects to your network wirelessly. You only have to worry about managing a single tether—a 10-foot USB cable attached to the camera body that plugs into a USB module with its own 15-foot power cable. This can easily be threaded through a single drill hole in your wall to plug into an indoor outlet. If you’re lucky enough to have a weather-proof outdoor outlet, so much the better. With its magnetic mount, you can attach Nest Cam Outdoor to any metal surface. No screws necessary. The camera is built to brave the elements. Its housing’s IP65 rating indicates it’s protected from dust ingress and low-pressure water jets. In practical terms, that means it can withstand the dusty environs around your home and the occasional spray from a garden hose when you’re washing down the external walls of you house. The USB module is even more protected from the elements. It’s rated IP67, allowing it to be submerged in about three-feet of water—think snow or rain puddles—without risk. It has an operational temperature range of -4 degrees to 104 degrees F.
The camera comes with a magnetic swivel mount that lets you easily attach it to any metal surface, such as a rain gutter or patio door frame, and easily move it to other positions as desired. The camera also includes a wall plate and screws so you can give it a more permanent home. Cable clips secure the cable to the wall. Like its indoor counterpart, Nest Cam Outdoor delivers 1080p video with a nice, wide 130-degree field of view in both daylight and night-vision modes. It also features two-way audio. This allows you to hear as well as see what’s going on—particularly important if something is happening outside the camera’s line of sight—and potentially scare off an intruder with your voice. You manage the camera and its video feed using the same Nest app you use for your indoor Nest cam. It was recently updated to include some advanced new features such as “person alerts” and “Sightline” (more on those in a bit), but to take full advantage of them, and to store your video footage in the cloud, you’ll need to pay for a Nest Aware subscription. You automatically get Nest Aware free for 30 days from the moment you set up a new camera. If you want to continue after the trial period, subscriptions run $10 per month to store 10 days of video, plus $5 per month for each additional camera; or $30 per month to store 30 days of video, plus $15 per month for each additional camera. You can get discounts on each with annual subscriptions. It will be interesting to see how Canary’s new Canary Flex outdoor camera measures up to Nest’s camera. If you’ve ever set up an indoor Nest Cam, the outdoor camera process will seem familiar. You can either use the Nest mobile app, which requires you to scan the QR code on the camera, or plug the camera into a USB port on your Mac or PC to set it up through the Nest website. In each case, a setup wizard walks you through the painless process of adding the camera to your Nest account and connecting to your Wi-Fi network. Using the magnetic mount, I was able to have the camera up and running in minutes. I merely stuck the mount to the metal railing of the balcony overlooking my side yard, and plugged the power cord into an external outlet—no muss, no fuss. The magnet is exceptionally strong—it was immediately clear I didn’t have to worry about the weight of the camera pulling it loose—and with 25 feet of total cable, you have considerable flexibility with positioning. Sightline lets you quickly find security events without wading through hours of video. When you select a connected camera from the Nest app, you’re taken to its live video feed. Video is displayed across the top of your device screen. You can zoom in or out on an area by pinching the camera image and set it to record at a particular zoom level. You can also rewind or advance the live video in 15-second increments by tapping the appropriate icon on the image. As mentioned earlier, one of the app’s new features is Sightline. Essentially, it’s horizontal timeline below the live feed window. You scroll through it to quickly locate events, which appear on the timeline as preview images, without having to wade through hours of footage. When you stop on a thumbnail, it automatically plays the video of the triggering event. (Without a Nest Aware subscription, you can review only three hours of video history and you’ll see only the event thumbnails, not the video attached to them). Another new feature is “person alerts.” While the Nest Cam Outdoor will alert you to any detected motion, a new algorithm allows the camera to distinguish humans from anything else that might have moved in front of the camera. When it does, you get an alert specifically saying that it sees someone, or if the person is partially obscured, that it “thinks” it sees someone. Person alert were pretty accurate in my experience using the camera; even when it wasn’t sure it was a human, it invariably was. What the camera won’t do is try to identify that person, as the Netatmo Welcome indoor camera not-so-successfully tries to do. If you have other Nest appliances in your home, you’ll be able to take advantage of the last notable new feature, Spaces. It lets you “place” all those products—smoke/CO detector, indoor cameras, thermostats—in virtual rooms on a graphical representation of your home. You can then control all of them from one screen within the app. 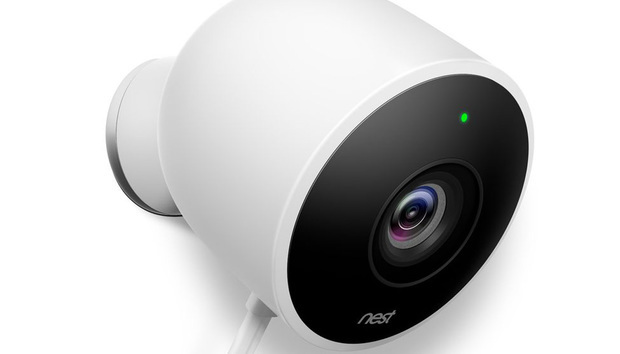 Overall, the Nest Cam Outdoor really brings the convenience and quality of its popular indoor camera to outdoor surveillance. Live video from the Nest Cam outdoor was superb, with vivid colors and no fish-eye distortion around the edges. Night vision was also clear, with details rendered crisply. In addition to the new features, the Nest app also provides plenty of ways to customize the camera monitoring—and reduce the occurrence of false alarms—including scheduling, activity zones, and geofencing. If there is one knock against the Nest Cam Outdoor, it’s that it doesn’t have a battery backup. That means if the camera loses power for any reason—including if a burglar cuts its power cord—it will stop working. Nest assures that in that event you’ll be tipped off with an alert that the camera is offline, so theoretically you can investigate—but that won’t do much good if you’re not home. And if you have a Nest Aware subscription, you’ll still be able review your video history up to the point of the power interruption. But if anything happens between the time the camera stops and you get home, you won’t have any forensic evidence of it. If you already own a Nest Cam with a Nest Aware account and are looking to expand your security perimeter to the outdoors, this is a no brainer. The Nest Cam Outdoor is basically a weatherproofed version of the camera you know and love, and you can add the camera to your subscription for a modest fee to be able to view all your cameras in one app. If you’re not invested in the Nest ecosystem, well, we still recommend the Nest Cam Outdoor as a great DIY outdoor security camera--for now, at least. That could change when the Canary Flex hits the market. And don't forget alternatives like the Kuna Outdoor Security Light and similar but not-yet-available Netatmo Presence. You just have decide if using its advanced features are worth the long-term cloud subscription costs when other less-expensive contenders like Netgear's Arlo HD are available.